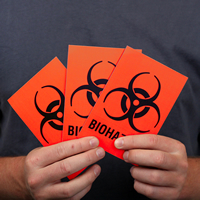 Our fluorescent Biohazard Labels are high-quality and made of durable vinyl. • Certain models include space to write in a particular hazard. • Sold in rolls of 500. • Made from 4 mil vinyl, which is flexible and conforms to irregular or curved surfaces.